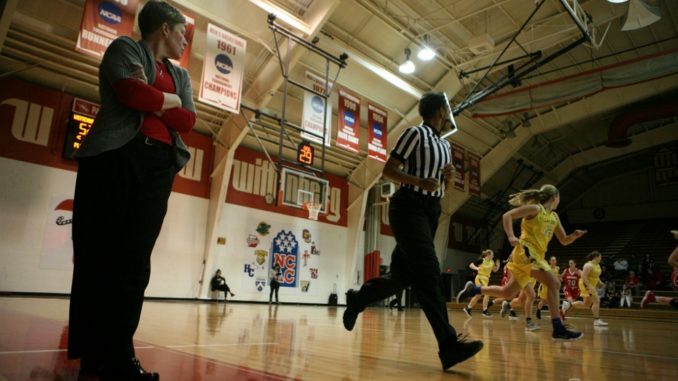 Wittenberg women’s basketball team played back-to-back games at Pam Evans Smith Arena this past weekend. On Friday, the Tigers defeated the Hiram Terriers by a score of 77-61 and then proceeded to down the Allegheny Gators the next day by a score of 62-34. The game against Hiram was the annual Play-4-Kay game where fans and Wittenberg’s team wore pink clothes or accessories in support. Wittenberg outplayed Hiram in rebounds, assists, points in the paint and bench points. Kristie Kalis, ’21, cataloged her third double-double of the season, posting 25 points and grabbing 10 rebounds, adding an assist and a steal. Kalis was not the only Tiger player who scored in the double-digits, Alex Kiess, ’19, earned 13 points and Riley Culver, ’20, posted 10. Wittenberg got out to an early 5-0 lead, then Hiram tied the game back up and buckets were falling left and right. Wittenberg gained a slight lead in the second quarter at 28-21. Kalis scored an easy nine points in the first quarter. Wittenberg had an early 23-19 lead at the end of the first quarter. The Tigers defense was causing a lot of problems for Hiram’s offensive game. At the end of the first half, Wittenberg had an easy 10-point lead at 38-28. To start the second half, Hiram was able to find some success making some changes to their game plan. They cut the lead down to six points, trailing 40- 34. Despite the Terriers trying to make a comeback, the Tigers defense was stifiling Hiram by making them shoot long into their shot clock. With four minutes left in the third quarter, Hiram was able to cut the lead down to six again. In the fourth quarter, Wittenberg did not let up the reins to allow Hiram to make another run. During the last two minutes, Hiram emptied their bench and Wittenberg won 77-61. Following the win against the Terriers, Wittenberg had to prepare to battle against the Allegheny Gators. The Tigers demolished the Gators by the score of 62-34. There were three Tigers that scored double digit points. Korynne Berner, ’20, led all Wittenberg scorers with 11 points. She also added three rebounds, two blocks and an assist. The other two players who scored in double digits were Culver, ‘20, and Kiess, ’19. Wittenberg won the tip to start off the game. The scoring and defensive play were strong against the Gators. Allegheny was unable to score until there were five minutes remaining in the first quarter. Wittenberg ended the first quarter with a nine-point lead 13-4. During the second quarter Alleghany caught the hot hand as they cut the lead down to eight, 22-14. This run had come with two minutes left in the half. Kiess tallied seven points during the second quarter. She made a three pointer, which was assisted by Berner, and back-to-back jump shots to end the half. The Tigers outscored the Gators 17-8 in the third quarter. Culver scored a majority of her 10 points in the third, also pulling down two rebounds. By the middle of the quarter, both teams had pulled their starters out of the game and put their bench players onto the court. Wittenberg improved their record to 14-8 as NCAC conference play continues to roll on. The Tigers next game is on Wednesday, Feb. 6, as they will travel to Ohio Wesleyan and play at 7 p.m.